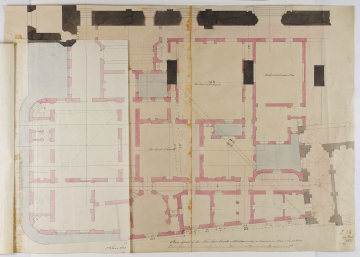 The Day Book entry for 29 May 1823 notes that Stephen Burchell was About the drawings of the New Courts at Westminster. The Day Book entry for 29 May 1823 notes that Edward Foxhall was About the drawings of the New Courts at Westminster. The Day Book entries for 3-4 June 1823 both record that the same draughtsman was About a Plan of the New Courts at Westminster, implying that he executed the flyers. The vestibule to the Court of King’s Bench from Westminster Hall has pencil sketches for adding two symmetrical ancillary spaces either side of the entrance; one is a water closet. The adjacent staircase has also been sketched over. There are dashed diagonal survey lines (with measurements) relating to the northernmost buttress of Westminster Hall and the staircase turret on the hall’s north-western tower. The lower flyer (dated 3 June 1823) shows different internal provisions for water closets and staircases, with groined ceilings indicated. The upper flyer (dated 4 June 1823) shows two entrances from New Palace Yard positioned on the curved corners. Both have steps across the basement gulley and art articulated with columns. The anciliary spaces behind the New Palace Yard façade are again cofigured differently. Both flyers show the basement gullies and the canopy over the King's Bench tribunal is shown in dashed line. The groin vaults of The Stone Building's central block are also shown by this method.